With these effective, efficient, and integrated mobile marketing campaigns, business owners and marketers will garner enviable response rates and watch their revenue grow more rapidly than ever before. 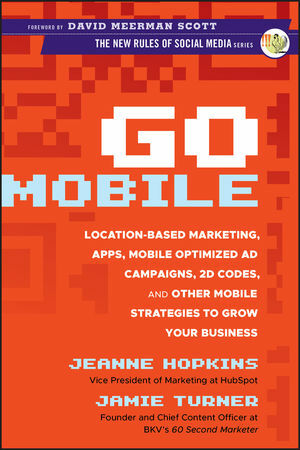 JEANNE HOPKINS is the Vice President of Marketing at HubSpot, generating over 45,000 new leads each month and leading the company in new mobile initiatives. She helped push HubSpot to become mobile-enabled and writes blog posts for HubSpot's mobile blog, which 11.3 percent of readers now access through their smartphones. JAMIE TURNER is an author, speaker, and the founder of BKV's 60 Second Marketer, an online magazine that provides tools, tips, and tutorials for marketers around the globe. He is also a regular guest on CNN and HLN on the topic of digital media.